Spring has sprung(ish..), so while we all begin to dream about our summer holiday, what better way to indulge in a little getaway fantasy than with the beautiful scenery of Italy in The Talented Mr Ripley. Although it’s the gripping storyline and incredible acting that are the main points of this film, you can’t help but wish you could flit along the Italian coast – albeit without Tom Ripley’s wake of destruction. This psychological thriller follows Matt Damon as Tom, a young man who is mistakenly welcomed into the world of wealth and privilege, and who will do anything to remain there. The brilliant supporting cast of Jude Law, Gwyneth Paltrow, Cate Blanchett and Philip Seymour Hoffman are all caught up in Ripley’s web of deceit, as he juggles them, loves them, and tries to avoid their ever-growing suspicions. Set in the late 1950s, Paltrow’s Marge and Blanchett’s Meredith are incredibly elegant, providing perfect inspiration for a chic, retro spring-summer look. 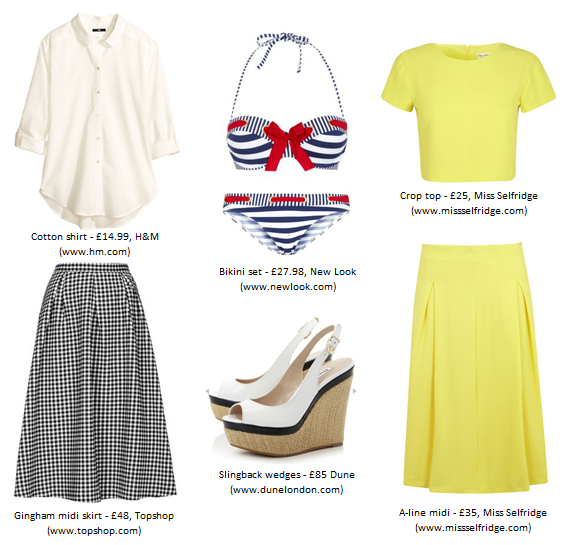 Co-ordinating separates play on the lady-like feel, and Marge’s tie-up shirt with a full midi skirt is very on trend. Add nautical prints and accessories for a touch of the Italian Riviera glamour. We love these chic, effortless looks. Needless to say, we’re totally inspired. Thanks for sharing!